(Eggplant Detail right). Once again, Nature in her infinite wisdom, seeks to teach us to observe her varied and playful forms. Here, the star attaching the fruit to the stem connects twin eggplants. I saw this specimen as a vegetal star, a cosmic sign of the unity of matter and spirit. When I saw this purple beauty in the bin at the Roxbury Farm pickup location here in Westchester County, New York, I just knew I needed to shoot its portrait. 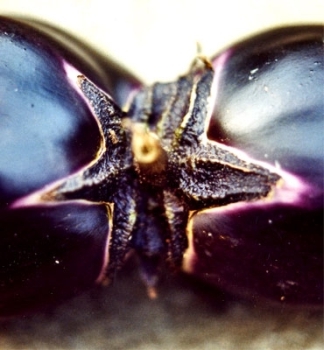 Eggplant is offered in a signed, limited edition of 250, printed on 8.5" x 11" archival matte paper which enhances its rich deep purple tones.